Private surf, skateboard, snowboard, and SUP lessons/coaching! BOARD? HAVE YOU REACHED A PLATEAU? 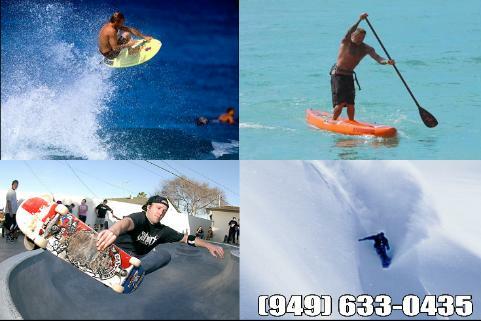 PRIVATE SURFING, SKATEBOARDING, SNOWBOARDING, AND "SUP"
WE CAN HELP NO MATTER WHAT YOUR GOAL! OUR "NO PRESSURE" APPROACH IS BASED ON JUST HAVING FUN! WORLD CLASS INSTRUCTION AND CROSS TRAINING PROGRAM. YEARS OF VERIFIABLE COACHING EXPERIENCE! DOOR TO DOOR SERVICE IS AVAILABLE FREE, DEPENDING ON LOCATION!